It’s National Signing Day! 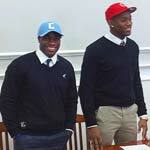 Congrats Alan Watson – headed to Columbia University & Darron Lee headed to The Ohio State University! We are so proud!